1) Start with The Star. Begin from the Sports section, then to the international news section, before checking out the headlines, and then finally reading Section 2, which would usually cover the entertainment articles. 2) Throw The Star aside, pick up the entertainment section of Sin Chew Daily, a Chinese paper to read the latest celebrity gossip. 3) Put that entertainment section of Sin Chew Daily aside, and check out the entertainment section in China Press, another Chinese paper for things left out by Sin Chew. But anyway, I was reading through the entertainment sections of The Star before something caught my eye. My dad's name. And also, a hideous photo of his that was taken probably during the late 80s or early 90s. "Ew! You looked SO FAT!" I remarked. Mom and dad, interrupted from their conversation, looked at me, and then at the nice little article about my dad I was pointing at. Apparently they were both unaware of the article, and mom couldn't believe that it was a photo of my dad, since she had never seen him with, well, that much hair before, nor look THAT fat. She firmly believed that The Star had most probably put up a photo of some fat guy who bears a passing resemblance to dad. 25 years of marriage and she had never seen my dad looking like that. Pillar in the Malaysian music industry...? Mom and I chit-chatted about the article yesterday. We agreed that the household may have underestimated dad's reputation (in fact, we didn't expect people to leave comments about my dad's contribution on my post about Loga's passing last month). Maybe because we were so often exposed to his Homer Simpson-esque antics at home. Hah. 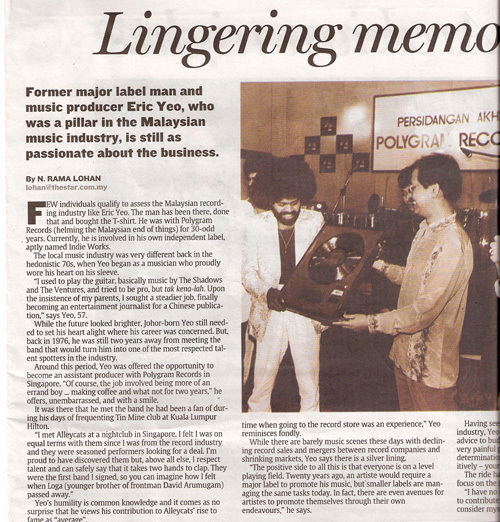 Anyway, once again, here's the link to The Star's article about my dad. It's mostly about him talking about the music industry of then, and now. Some quotes from my dad. "The music business is still business, you have to remember that. The priority has obviously changed these days. I’m old-school – I never use money to attract artistes. I’ve always maintained the philosophy that we (the artiste and I) can do something together and we’ll see the returns from the fruits of our labour." "Twenty years ago, an artiste would require a major label to promote his music, but smaller labels are managing the same tasks today. In fact, there are even avenues for artistes to promote themselves through their own endeavours."